INTERVIEW. Mads Brügger spent seven years working on 'Cold Case Hammarskjöld', where the director and Swedish investigator Göran Björkdahl track the bizarre death in 1961 of UN Secretary-General Dag Hammarskjöld, and in the process stumble on a scandal far more shocking than they could have conceived. World premiere at Sundance Film Festival. The darkest, most sinister and complicated Eric Ambler and John Le Carré spy novels hold nothing on the story that Danish director Mads Brügger tells in his astonishing new documentary, 'Cold Case Hammarskjöld'. Together with his sidekick, Swedish private investigator Göran Björkdahl, Brügger not only solves the 50-year-old mystery of the death of United Nations Secretary-General, Dag Hammarskjöld, in a plane crash in Zambia in 1961. (Yes, it was murder.) The Danish director also eventually uncovers evidence of a racist conspiracy of unspeakable evil that may have cost the lives of thousands of black Africans. What really interested me was everything connected to Dag Hammarskjöld's death – this strange crash you could spend months if not years researching and investigating because it is such a bizarre event. In the film, Brügger comes across like a detective in a private eye mystery. We see him in a hotel room in downtown Kinshasa, DR Congo, with his two secretaries, Clarinah and Saphir, typing up the case and sticking post-it notes on the wall. He is dressed all in white. That is the costume favoured by the villain of the story, of whom he has a single photograph. "This could either be the world's biggest murder mystery or the world's most idiotic conspiracy theory ..." These are the words one secretary types on Brügger's behalf at the start of the film. Brügger first became intrigued by the Dag Hammarskjöld case when he read about the Swedish investigator Göran Björkdahl tracking down elderly, previously ignored black witnesses of the Hammarskjöld plane crash. "I thought, 'this is very interesting. Maybe there is a film in it.' That is how it began." 'Cold Case Hammarskjöld' is world-premiering at Sundance Film Festival 2019, 24 January – 3 February, and making its European premiere at the Göteborg Film Festival, 25 January – 4 February. As a mischievous Dane, Brügger had always been a little sceptical about the extreme reverence in Sweden toward Hammarskjöld. The UN boss who died in such murky circumstances in Africa is regarded by some Swedes as a secular saint, "a little like Martin Luther King," Brügger says. "They call him the 'lord of peace' and so on. There is this Messianic side to Dag Hammarskjöld which also correlates to the way he dies. It is almost like the way Christ goes to Jerusalem and delivers himself to his assassins." For Brügger, Hammarskjöld's interest lies in his role as an "active and also provocative" diplomat who became a key player in Cold War politics – and who stood firm against the old colonial powers. "But what really interested me was everything connected to Dag Hammarskjöld's death – the way it happened, this strange crash you could spend months if not years researching and investigating because it is such a bizarre event." The director likens the process of making the film to trying to open a Chinese box. "The more you study, the more you discover … and the more weird it becomes." Morbid little details about the death could leap straight from the pages of a Dashiell Hammett or Raymond Chandler mystery. For example, when Hammarskjöld's body was recovered, an ace of spades, supposedly a "death card", was found under his collar. The more complicated the mystery became, the more determined Brügger was to make sure that spectators could follow it. That was one reason for hiring the two secretaries. Clarinah and Saphir were "avatars for the audience". If they didn't understand what was going on, the director realised that neither would viewers. All the essential documents – the memos, letters and unpublished memoirs that helped Brügger unravel the mystery – had been written on typewriters. That prompted the director's decision to chronicle every new development in his own investigations in typewritten notes which he stuck on the wall of the Kinshasa hotel room. He also uses extensive voice-over and even pieces of animation to ensure that viewers don't get lost in the maze of facts. "I really had my doubts about the animation. Once you use it, it is a point of no return," the director acknowledges. He knew, though, that using animation would enable him to visualise elements for which no archive was available. It helped, too, that animation director Claudia Bille Stræde produced such striking work. Brügger being Brügger, the film has its humorous moments. As in his celebrated earlier documentaries, 'The Red Chapel' and 'The Ambassador' (both of which also played in Sundance), he is a dry, comic presence in the story he is telling. He dresses all in white, just like the shadowy man he is investigating. We see him bumbling around with a metal detector. The "funny stuff", though, is soon left behind as the extent of the evil and corruption becomes clearer. "In essence, the film has to do with interracial relations; the dark side of the whites in Africa," the director reflects. 'Cold Case Hammarskjöld' has the kind of villains you'd expect to find in a James Bond movie – a rogue pilot with the nickname The Lone Ranger and a charismatic mercenary boss called "Commodore" Keith Maxwell (he is the one who dressed always in white). The trail leads eventually to South Africa and to a very shadowy clandestine organisation called SAIMR, the South African Institute for Maritime Research. Maxwell was in charge of its military unit, Delta. Bizarrely, this brutal and corrupt man had written his own semi-fictionalised autobiography. Brügger is full of admiration for his partner in the film, Göran Björkdahl, who had been investigating the Hammarskjöld case for many year. Before meeting him, he worried that Göran would be a "tinfoil hat-wearing conspiracy theorist". As it turned out, the Swedish sleuth was meticulous and rational – someone who went to extreme lengths to try to disprove his own theories. He was also very stubborn. Whatever obstacles were placed in front of him, he never became distracted or downhearted. "If you could merge Sherlock Holmes with a Volvo, you would have Göran Björkdahl," the director says of his dogged, clear-thinking collaborator. Even in advance of its Sundance premiere, 'Cold Case Hammarskjöld' has spilled from the culture section into the news pages. It has been the subject of front-page stories in British newspapers. Media fascination with the documentary is bound to intensify once the film's revelations about the white conspiracy to infect the black population of South Africa with HIV become more widely known. Brügger has been working on 'Cold Case Hammarskjöld' for seven years. There were many times when the project came close to "shipwreck". He and Björkdahl endured multiple disappointments along the way. Many of their leads took them precisely nowhere. At times, they felt that maybe they too were just like all the other paranoid conspiracy theorists who see sinister plots everywhere. At one point, a cherished piece of bullet-ridden metal that Göran was convinced came from the fuselage of Hammarskjöld's plane turned out to be a piece of junk from an old Land Rover. They kept going, though, and in the end, the scandal they stumbled on was far more shocking and disturbing than even they could have conceived. In essence, the film has to do with interracial relations; the dark side of the whites in Africa. The film being shown in Sundance and Gothenburg isn't the full story. There are still loose ends, facts to be checked and new tidbits of very disturbing information involving the British and Russian secret services. Brügger and his producers are contemplating making an extended TV version of the film which will deal with the subject matter as greater length. What does Brügger do for recreation when he is working on a project as complex and sinister as 'Cold Case Hammarskjöld'? "Actually, I am just re-reading one of my favourite Eric Ambler spy stories, 'The Intercom Conspiracy'," he says. This is one of Ambler's darkest and most celebrated espionage novels, set in Switzerland during the Cold War, but its plot seems like plain vanilla when set against the story Brügger tells in his own 'Cold Case' documentary. 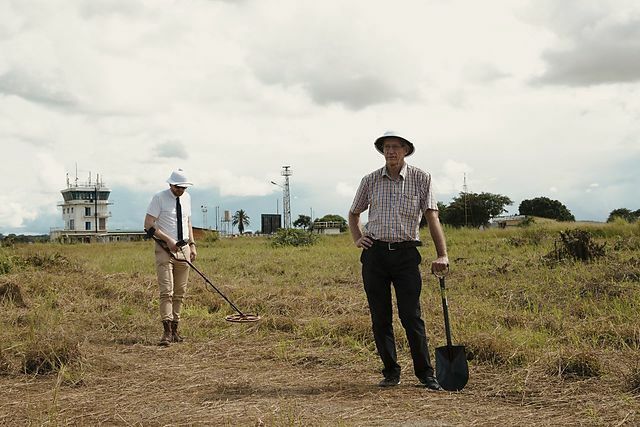 'Cold Case Hammarskjöld' is directed and written by Mads Brügger and produced by Peter Engel for Wingman Media in co-production with Norway's Piraya Film, Sweden's Laika and Belgium's Associated Directors. DR Sales is handling international sales. Domestic premiere is set for 7 February.